Sundays April 8, 15, 22, and 29. Local Columbia yoga studio, SWAY Yoga, will be offering free, beginner, yoga classes on Sunday afternoons in April from 1:00 pm – 2:00 pm. The instructors at SWAY Yoga provide many modifications for the poses so they will be accessible to everyone. 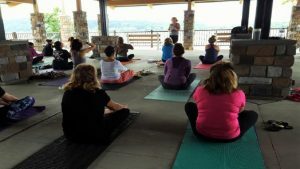 If the weather is nice, class will be held outside on the deck, overlooking the beautiful Susquehanna River. Pre-registration is required as space is limited. 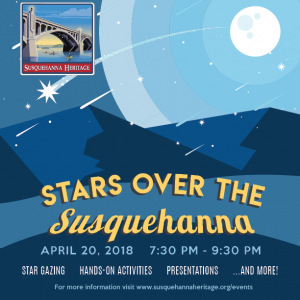 Join Susquehanna Heritage for Stars Over the Susquehanna on April 20th for an evening of stargazing and exploring the night sky while reveling The National Park Service’s Monthly Theme for April: Find Your Park After Dark – Starry Skies. At Columbia Crossing River Trails Center, we will be joined by the Astronomy Enthusiasts of Lancaster County (AELC) for a public star watch party and presentation. Have you ever wondered how many stars there are or where they came from? How about black holes and galaxies? Join us for an informative, science-based discussion of these topics and more starting with a presentation inside Columbia Crossing at 8:00 pm followed by viewing through telescopes outside, weather permitting. The telescopes will show a variety of celestial objects such as the Pleiades star cluster and the Orion nebula. AELC will also be pointing out various constellations and discussing how to navigate the sky using smart phones. Across the river at the Zimmerman Center for Heritage, from 7:30 pm – 9:30 pm, learn how early explorers like Captain John Smith navigated by using the stars, and create a navigation tool similar to those that early explorers used. Both sites are FREE and open to all ages. Have a fun evening exploring the night sky with your friends and neighbors at two scenic spots along the Susquehanna River.